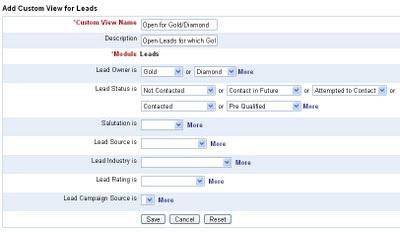 iFreeTools CRM just got an update with the new Custom Views feature. Note : Ability to create Custom Views has also be enabled in iFreeTools Creator, our online database app builder for Google Apps. 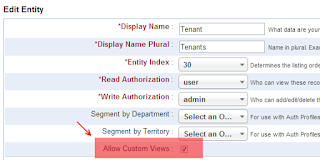 If you do not see this option when viewing the records for your custom entity, kindly verify if you have selected the Allow Custom Views option for that entity. 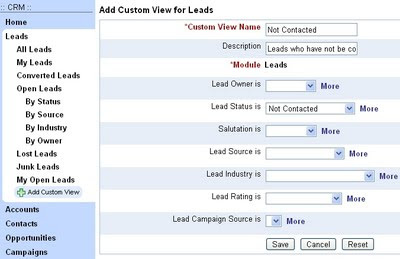 Clicking on the Add Custom View link available under each module of CRM, will bring up a form wherein one can provide the view name, description and the criteria to be used for filtering. 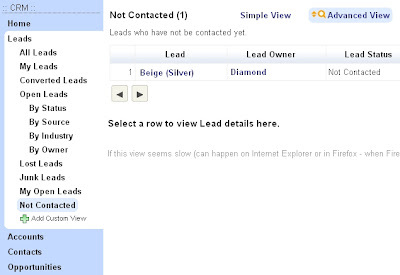 For example, to view all leads who have not been contacted yet, one can create a "Not Contacted" view as shown below..
Once the view is created, it will be listed along with the predefined views in the module..
One can also provide multiple values for the criteria. 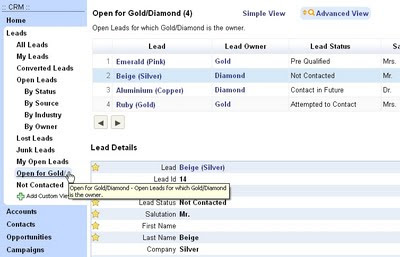 For example, to view all Open Leads by specific owners (say, for users "Gold" and "Diamond"), one can create a view as shown below (notice multiple values in OR for Lead Owner and Lead Status).. The resulting view will use all values in the criteria to provide the results.. 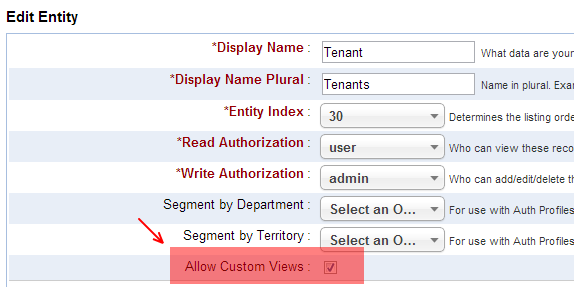 Such Custom Views will be available for use by all users within the application instance, while admin users alone can create/modify/delete Custom Views. Currently properties with choices and reference properties alone can be used in providing the filter criteria. For other filtering one can use the search within the Advanced Views, for now. We will be coming up with more options for filtering at a later upgrade. Check out the new feature and feel free to send us your feedback. Is iFreeTools a free CRM? But how it is better than other 100s of CRM available in the market? > Is iFreeTools a free CRM? iFreeTools is not just CRM. CRM is just the first application in iFreeTools, which will offer a suite of business apps. All applications will have an ad-supported free version, to start with. As the user's requirements grows, one can purchase more resources (more storage, more emails), using tiered pricing. > But how it is better than other 100s of CRM available in the market? iFreeTools is built for deployment over Google App Engine and for integration with Google Apps. Customers have already started deploying iFreeTools in their Google Apps Domains (Related : iFreeTools CRM on your sub-domain, with rebranding !!). In the AppEngine-CRM space, I am not aware of any other better featured CRM application, at least from those listed on.. I am sure more applications will show up. Choice and competition is always good. I really like this "add custom view" feature. However, when testing it, I created some custom views that I no longer want. How do I delete a custom view that I don't want to display anymore? @veebee : Click on the "Options" button in the list view page and you will find links for "Edit View" and "Delete View".